There are few simple pleasures in life; one of these is surely a cup of steaming tea on a cold day, or a refreshing iced tea on a hot summer day. You only have to breathe the grassy scents of tea to immediately feel relaxed, comforting sensations. And why not use it to purify the body of all excesses too? Studies have shown that as long as we consume healthy foods, remain active and sleep well and at appropriate times, the body detoxifies itself naturally. If you’re looking to eliminate free radicals and purify the body of excesses accumulated via overeating, green tea is a valuable asset to your diet. Its use in purifying the body is due to its high polyphenol content. What are polyphenols? They are powerful antioxidants that neutralise destructive compounds within the body, better known as free radicals. Free radicals damage cells and DNA, contributing to the acceleration of the ageing process and increasing the risk of vulnerability to various diseases. 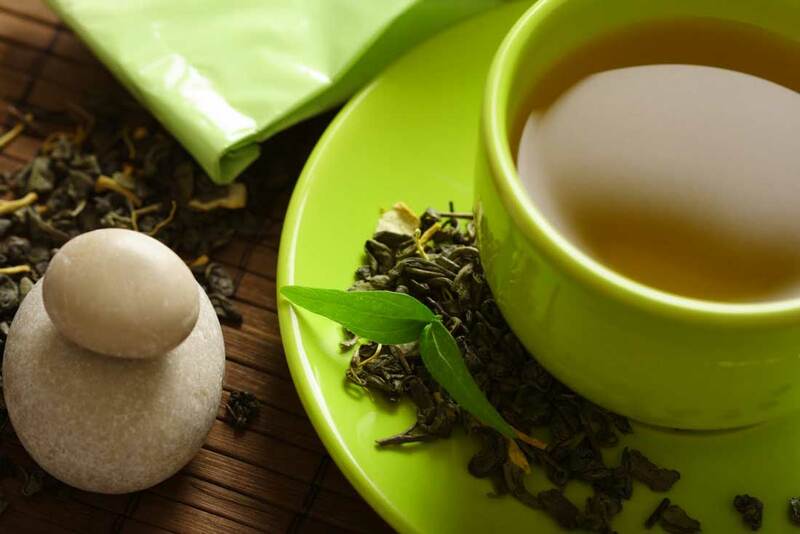 Historically, green tea was used in Chinese and Ayurvedic medicine to treat a wide variety of health conditions. Green teas differ from black or oolong teas in that they are derived from non-fermented leaves, a process that appears to preserve polyphenols. The leaves come from plants that are grown mainly in Asia, the Middle East and Africa. Known for its antioxidant properties; it is also useful for fighting the effects of ageing, and in fact facilitates cell renewal, leaving the skin softer and more youthful. Green tea (or at least its extract) is sold in various forms: as tablets, freeze-dried, and in face and body creams, scrubs and beauty masks. You can make a DIY face mask, and out of the many recipes available, this is perhaps the easiest and most effective. Prepare some strong green tea; tea leaves or teabags can be used. Let it cool and pour two tablespoons into a bowl. Add the lemon juice, two tablespoons of plain yoghurt and a tablespoon of honey. Mix everything well until the mixture is uniform and homogeneous. Using a spatula gently spread the mask onto clean, make up-free skin, avoiding the area around the eyes. Leave it to take effect for about twenty minutes. Once this time is up, rinse your face with plenty of warm water and pat your skin dry with a towel. This mask is highly effective against tired, dull or opaque skin, and furthermore is a natural alternative to cosmetic products. And as a final “top tip”, you should definitely try the fabulous rejuvenating scrub offered by the spa at the Grand Hotel Villa Serbelloni, an unmissable antioxidant and moisturising treatment... done strictly using green tea!